Zombie Head Casting Day – and Freddy Krueger attack? 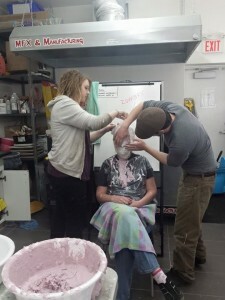 Zombie head casting was everything we could wish for – long, messy, productive, and fun! Our SFX masters Sean George and Eden Kontrimas accompanied four of our “horde” zombies with Blair and Samantha for a day of mold making and casting. At the Toronto School for Professional Make-up where Sean is a teacher by day, we had the luxury of the entire FX department for the whole 7 hours it took to create these beauties. Volunteering their faces to the zombie cause were Mandi Sunshine, Richard Chuang, Lex Darian and Justine Cargo. And Blair couldn’t let the day go by without getting a cast of himself done – for future posterity. These casts are destined for the highest tier of ZomBFX full face prosthetics for our Ripe ‘n Rotten zombies. We’re even considering selling them online if we can swing that. Everyone wants to look as good as these guys after Sean gets done with their zombie FX, so why not share the love? In the course of mixing and pouring and generally making a mess, someone thought to read the instructions on the Alja-Safe (alginate or Alginic acid used to make temporary molds needed on body parts when making life casts). The instructions say “must wear gloves”. And we were smearing this all over everyone’s faces. Concerning? Well, it’s called “Alja-Safe” not “Alja-Cancer“, after all, so pretty sure no one will suffer any adverse effects. 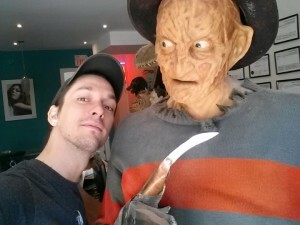 Blair and Freddy – a dream come true! When any part of the Bony Fiddle crew get together, it never fails that some hilarity will ensue. At one point, when Samantha was working to film a little blurb with Mandi, she was “attacked” by Freddy Krueger and couldn’t get loose. Not to worry, she’s safe and her sweater just got caught on one of the claws of a life size (and very realistic) statue of Freddy. Blair’s Freddy obsession was in overdrive as you can imagine. Each mold made separately, Sean and Eden went through a cycle of hair covering, applying Vaseline, smearing Alja-Safe all over each victim, er, volunteer’s heads and wrapping with plaster bandages. Once set and removed, they moved on to the second step of the life casts which involved coating the insides of each temporary cast with cement and burlap for strength. A short time later, the temporary molds were torn off, leaving the finished zombie head casts. 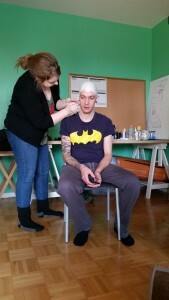 7 hours and lots of clean-up later, we had 5 perfect head casts. 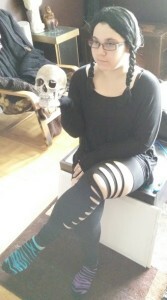 They’ve now joined the ranks of recently created Bony Fiddle skulls in Blair’s workshop. Destined for zombie fame, we plan to get lots of use out of them and you’ll see them in action the next time you order some Ripe ‘n Rotten zombies for your event or shoot. 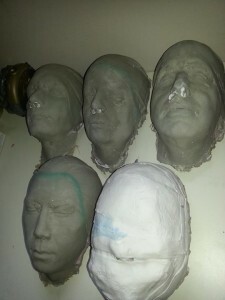 Posted on 29th March 2015 24th July 2015 Author JD StanleyCategories Props and SFX, ZombiesTags mold making, plaster cast, prop making, zombie, zombiesLeave a comment on Zombie Head Casting Day – and Freddy Krueger attack? 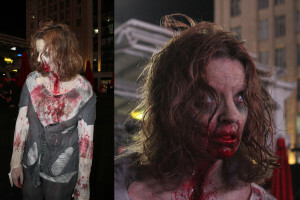 Dundas Square ZOMBIE promo a HIT! On Saturday, August 30th, we hit up Dundas Square with two of our zombies from our upcoming show Lost Refuge, the second of our double bill feature, to generate some hype about our production, and from the moment we left my apartment we knew it was going to be a great night! Our zombies for the evening, played by Mandi Sosnowski and Justine Cargo, also featured in our show, were very excited to be a part of the promo and we couldn’t have been more happy with their performance. We learned one valuable lesson during our night out, if you want attention, make friends with a zombie or two! We rode the subway there and back and even before we got into the train, we had already given away our first promo card to interested bystanders. People were taking pictures and videos from across the subway platform, over their shoulder, and around poles. Some couldn’t stop staring, some could only look for a second before being grossed out, and others just wanted to get up close and personal. People couldn’t get enough, and we have our talented special effects make up artist Sean George to thank for that! The work he did on these zombies was so great and even made some full grown men run away screaming. No really, we’re not joking. A little later in the evening, we even had a few people ask if we were a part of the TV show “The Walking Dead” doing a season five promo as part of the Fan Expo that was happening all weekend. Thank you, we’ll take that as a compliment, and we love The Walking Dead. When we got off the subway at Dundas Station, and our zombies learned how to open doors on their own, we were greeted by a group of guys that wouldn’t get close enough for a picture, along with a whole bunch of people stepping up on their own to take a selfie with a zombie, and that’s just the beginning. As we crossed the street and weaved our way into Dundas Square, we quickly generated a crowd. I’ve never seen so many selfies being taken. We had people running up to snap a picture and then taking off, people asking what it was all about, others just stood by and watched. There must be hundreds of pictures floating around the internet now. 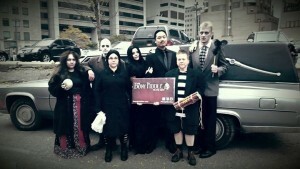 Some were foolish enough to try to talk to the zombies and ask for a picture, but we all know zombies don’t talk. We even made a little friend, a young boy who was fascinated with the make up and how we did it. 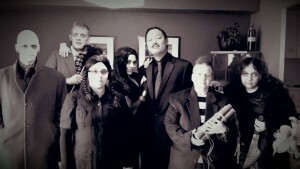 Over all, the evening was a lot of fun and we got to scare a whole bunch of people. It was an evening well spent. Would we do it again…? Hell yes! And we might too, with all our zombies! Our show opens on September 11th at the Tranzac Club, located at 292 Brunswick Ave, in Toronto. Come join us for our opening night party. The doors open at 6:30 PM and includes live music by Jeremy Panda, desserts by Chi’s Cakes, drinks from the bar (sold separately) and a chance to win some great prizes, all before we get on with the show at 8 PM. Our other three performances are on September 12 @ 8PM, and September 13 @ 2:30 PM and 8 PM. Tickets range from $25 for the Saturday Matinee to $40 for the opening night party and show, and can be purchased online at bonyfiddlelive.com. 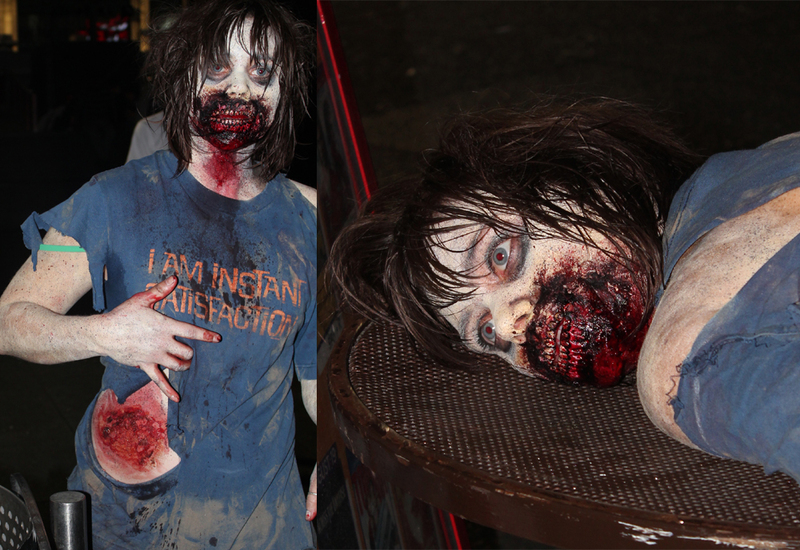 Posted on 31st August 2014 3rd August 2016 Author Blair MuellerCategories Events, ZombiesTags live performance, promo, public appearance, SFX, zombieLeave a comment on Dundas Square ZOMBIE promo a HIT!